If you consider yourself a gemologist, or aspire to become one, you have to have these volumes on your shelf. It's that simple. 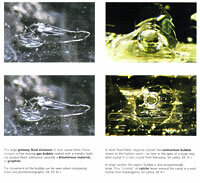 Photoatlas, Volume 2, the long-anticipated successor to Photoatlas, Volume 1, was released in December, 2005. Like Photoatlas, Volume 1, which was first published in 1986, the second volume in the series will become a standard reference in the field of gemology. 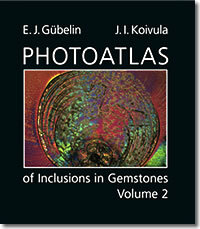 Once again, Dr. Eduard J. Gübelin and John I. Koivula have collaborated to produce an impressive pictorial atlas of gemstone inclusions. 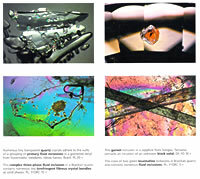 Renowned for their unique ability in capturing the beauty of the internal world of gemstones and bringing an artistic sensibility to a scientific subject in their photomicrographs, Dr. Gübelin and Mr. Koivula bring to Photoatlas, Volume 2 their considerable expertise and combined experience in laboratory gemology, mineralogy, geology and chemistry. 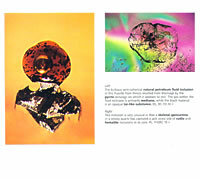 The second volume in the Photoatlas series complements Photoatlas, Volume 1 with greater depth and scope, featuring inclusion specimens from localities discovered after 1986 and examples of treatment techniques and synthetics that have appeared in the gem market in the last two decades. Each chapter contains current information on the micro-characteristics of natural, synthetic and treated host materials along with a complete selection of photomicrographs and a suggested reference section. The Photoatlas suite is an indispensable resource for gemologists, mineralogists, collectors and jewelers. Hardbound, approx. size 10 x 8.75 x 2, shipping weight 8 lbs. 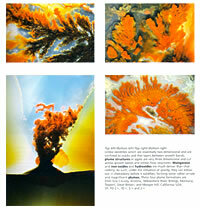 This book is a wonderful treasure trove for anyone with more than a passing interest in minerals and gems. 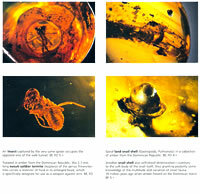 "The three volumes of the Photoatlas of Inclusions in Gemstones are not necessarily gemmological texts or gem identification manuals as such. Rather, they are a visual reference library containing numerous colour photographs with explanatory captions of inclusions and other micro features that prove useful in the identification of gem materials, and in the separation of natural gemstones from treated stones, synthetics, and imitations. While each of these volumes can certainly be read and enjoyed as individual books, the Photoatlas library is more specifically intended to be used together as a companion to a properly equipped gemmological microscope. 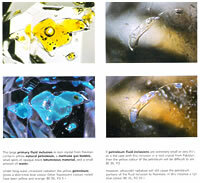 In that sense and purpose it is as much a piece of gemmological equipment as is the microscope itself." 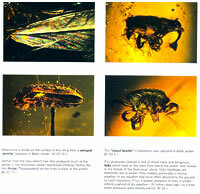 "Several thousand photomicrographs, each with a descriptive caption highlighting the main features depicted in each photo are contained in the three volumes in this colour image library. The supporting texts of the various chapters were composed to provide additional facts and information in more detail and depth, thereby fostering a greater understanding of inclusions and their importance to gemmology. The bibliographies provided at the end of each of the chapters can be used to guide the reader to additional reference sources if the need arises. 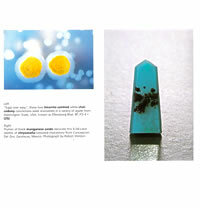 The Photoatlas volumes have been designed for gemmologists and jewellers, to enhance the usefulness of their microscopes in virtually all gem identification situations." This book and its predecessor should be part of every gemological library. To say that this book is spectacular would be an understatement. This book is available through GIA (USA) and GEM-A (UK) bookstores.